It all seemed to start unravelling with the showing in Milan. Sure, they had been beaten by Celtic earlier in the season but that was a game in which there were chances for Barca and they could have scored a few. That wasn’t the case against Milan, nor was it the case in the 2nd leg of the Copa el clasico. Those were shockingly poor performances by any recent Barca standards. Ones that led to mass speculation about the beginning of the end. So, is it? We’ll take a look at some specific issues below, as well as address problems already being discussed by the masses. Over the course of the last few months an increasing number of teams are employing two lines of extremely deep-lying defenders and midfielders. One major effect of such a system is that there is virtually no space between the midfield and defence. This in turn renders the ‘false’ 9 (F9) position ineffective. In essence, when faced with such a system, an F9 plays either alongside the centre-backs (becoming a regular 9) or in front of the opposition midfield (becoming a 10). In Barca’s case this means that Messi plays in a more traditional striker position, a role for which neither he nor the Barca system are ideally built, or drops deeper to play as a 10 – which leaves Barca without a central threat and with 2 lines of opposition between them and the goal through the centre. Against opposition of the highest calibre, Messi is sometimes silenced when faced with such tactics and Barca fail to work their way around it. What to do about it: This is actually not an easy problem to solve. Messi needs to be put in positions where he is close to goal and running at the defence…difficult criteria considering the packed defences. Alternatively, Messi can be moved to the left when breaking through the middle is becoming difficult. He can run at the flank and get to the by-line and try and put the ball in the centre. A better solution, of course, would be to try and free some space for him in the centre and let him go straight for the jugular. The same tactics that force Messi to drop deep also cause a few problems when Barca try and force their way through the middle; especially as the lack of space means that the ball has to be regularly fired in to a stationary player surrounded by opponents – opponents who force mistakes and intercept passes – often away from home where the ground is usually tailored to slow Barca’s game down. This leads to the ball being passed slowly and safely, giving the opposition time to breathe and hold their shape. The lightning quick movement of the ball that was the hallmark of Barca under Pep as well as earlier this season has gone missing. What to do about it: While Barca will never abandon their philosophy – nor should they – a few surprise runs behind the defence by multiple players with chipped through balls as well as some long-range shots would definitely help. The opposition needs to be kept guessing and forced to break shape. It’s all about triangles. That’s what enables the Barca system to be so effective. A player receives the ball and has multiple options to release the ball to, in multiple directions. Recently though, for a multitude of reasons, the triangles, especially when going forward, have been distorted or non-existent. The shapes held by other teams and Barcelona’s own lack of urgency have meant that quite often options are only in a straight line, making them predictable and easily negated. What to do about it: The passing pace needs to be quickened, and off the ball movement needs to be stepped up. Additionally, Barca need to get wingers to the by-line and have Messi + midfielders running in to the area – and the opposition defenders running back towards their own goal. There is a theory, with circumstantial evidence to back it, that the Barca fitness regimen is geared towards ensuring that the players are at their peak just before the winter break, and during the run-in to the end of the season. Since the beginning of Pep’s reign to the present, Barca have suffered defeats in Feb to Arsenal, Milan, Real, Atletico Madrid (twice), Espanyol and Sporting Gijon. During this time, Feb has also been littered with draws. The theory indicates that there is invariably a period of the season where the players are at their lowest physical condition – two-thirds of the season in – around this time. The results, along with the actual performances, seem to point to a dip in fitness levels. This year seems to have players that are more exhausted than in previous seasons. What to do about it: Every team faces periods in the season where they are not at their best. Considering the fact that movement off the ball, chasing down opponents in packs and covering more ground than the other team is the norm for Barca, if this is to be the period where they perform at their least intensive, then they have to figure out how not to lose Champions’ League first legs by more than a goal. They’ve managed it in the past. As I mentioned in an earlier post, Pep had instilled in his teams the work ethic with which they used the flanks and stretched the opposition by utilizing the full width of the pitch. Dani Alves would bomb down and overlap with whoever the right winger used to be and they would double team opponents. The opposition, however, has adapted. They are aware that a majority of runs will be down the wings and not in the centre. And they are willing to let the wide runs be made as they know that Barca will rarely cross high and central. This was especially difficult to contain in Pep’s first season, with Eto’o, Henry and Messi sharing 100 goals in healthy proportion. It was difficult to contain when Ibrahimovic was such a presence in the middle and chipped in with over 20 goals. It is, however, becoming easier with Messi being the only predominant goalscorer, and one who lacks a certain aerial presence. More importantly, Alves’s runs down the right were balanced somewhat by Abidal’s more measured approach on the left flank. It helped keep defensive solidity, and prevented Barca from being overwhelmed during counterattacks as they are now. Not that it is entirely Alves’s and Alba’s fault. Sure, Alves has been off colour and perhaps needs a new challenge – some crucial goals have come down his flank and he has lacked both discipline and drive during some big games – but there are other reasons. Being outnumbered and unable to break major opponents down, Barca have resorted to, what is in essence, a pincer movement. In this scenario, both flanks (Alves and Alba) charge down the sides and attempt to overrun the opposition. However such tactics against a numerically superior opponent (as is usual with opposition teams having 10 men behind the ball) are extremely risky and, if they break down, leave the team exposed and vulnerable to a direct counter-attack. A large number of goals conceded by Barca in the last month or so have been results of quick, direct counterattacks (think: Milan and el clasicos). In fact (if my memory serves me correctly, and moving back to military tactics), such is the difficulty of this tactic succeeding against such odds, that there are only two recorded incidents where a pincer movement was successfully executed against numerically superior foes – the first by Hannibal at the Battle of Cannae and the second by Khalid Ibn Al Waleed at the battle of Walaja. What to do about it: Asking the wing-backs to show some restraint is a simple answer, but I don’t think it is the correct one. In situations where Alves and Alba are forced to repeatedly try and breach the flanks, it may be wise to switch to a 3-4-3 formation, or a 3-5-2. Alternatively, it is not unreasonable – in exceptional circumstances – to switch to a 3-4-3 while asking Alba to play as left-centre back and bringing Adriano on to play on the wing. Alba’s pace will allow him to better withstand quick, sweeping counterattacks. It is also feasible that on occasion Barca switch to a 4-2-3-1 formation along the lines of the Spanish national team – one where the roving wing-backs and the attacking midfielders do not cause the team to be punished by counterattacks as two holding midfielders help protect the centre backs. In the last point, I gave the example of successful tactics employed by Hannibal and Khalid Ibn Al Waleed, two of the greatest military generals in history. They were tactically brilliant and great leaders of men. As much as the players and the club keep telling everyone that they are behind Roura and that they are taking Tito’s loss in stride, it is impossible to ignore the outcome. Roura does not seem to posses the tactical nous of Pep or Tito, nor does he seem to be able to galvanize the team and drive them on by sheer force of will. Even Puyol has seemed less vocal under him. This is not to take away from Roura who has been thrust in to the limelight under one of the brightest spotlights in football and has done what he can, but he seems ill-prepared for the role (again, not that it is his fault). Barca need a general. The players need to be motivated. What to do about it: What can one do? You either keep faith with Tito and his recovery, or you appoint a new manager. 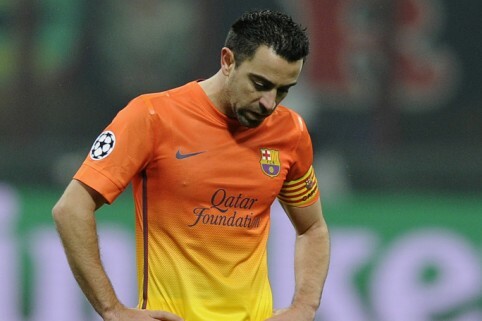 This season seems done and dusted, but Tito and Barca need to figure the future out. Roura cannot be the man in charge for a majority of next season. It’s that simple. There are a few managers out there with some Barca DNA. Perhaps one of them. Laudrup? Luis Enrique? De Boer? Dani Alves seems to have run his Barca course. Time to give Montoya a chance? Puyol’s age seems to be catching up with him, fast. Bartra has not yet come back in to the fold fully following his injury. Barca need a proper CB and one who will be able to play in the system. Hummels? Messi may be one of the greatest players of all time, but he cannot score every single goal that Barca need. Goalscoring responsibilities need to be shared. Defensive naivety has cost Barca crucial goals this season. It is time to start wielding the axe. Screw up because of lack of focus and effort, and end up on the bench. Give the youngsters a chance. The youth teams play in similar systems, but are usually more direct. Don’t throw Tello on with 10 to go. Let him start and let the opposition worry about adjusting. There are, of course, countless other points and reasons and possible changes. But I’ll leave that for discussion in the comments, on Facebook and on Twitter. We want to hear from you, so share your thoughts. So is it the beginning of the end?